Five days in Tilburg at the city’s Incubate Festival (now in its eleventh year): not a bad way to spend one’s holiday. Despite a population of only around 210,000 (it’s about the same size as Luton), Tilburg has an incredible array of music venues. Despite having the reputation of one of the uglier, more industrial cities in the Netherlands, it oozes creativity, which makes it the perfect home for Incubate. This is a festival that – through art, film, theatre and (most of all) music – provides a searing display of diversity. As one might expect from such a description of the festival, the highlights at Incubate are an eclectic mix. On one hand this is a festival all about volume. Merzbow & Full of Hell are, somewhat surprisingly, the calm before the storm on this front. Shrieking feedback is their game, but Friday night’s cavernous bass from King Midas Sound & Fennesz proves even more powerful. The floor shakes as the collaborators slowly unfurl wave upon wave of immense sound. 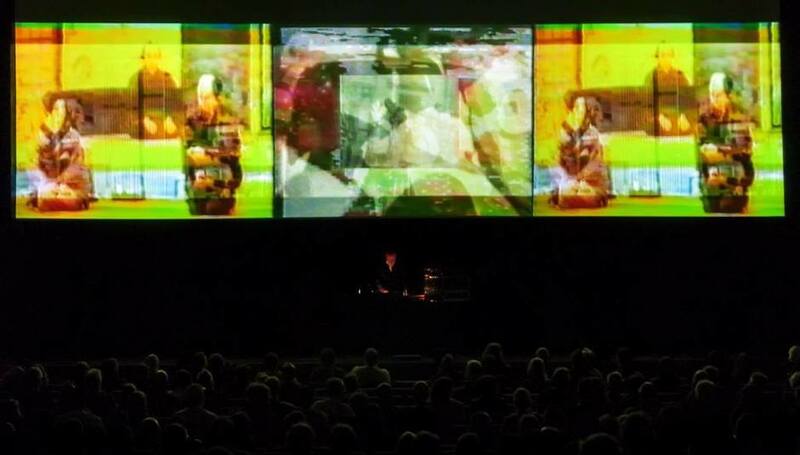 Only Cabaret Voltaire – now simply Richard H. Kirk alongside machines and visuals – are louder. Kirk’s set is surprisingly effective – marking Cabaret Voltaire’s transition from the early Nineties acid house/IDM phase into something that seemingly seeks to combine their industrial early days and the contours of modern techno. It’s brutal but also highly danceable. Then again, over the course of five days, there is also plenty of room for delicate sensitivity. Back to back sets from Fennesz & Arve Henriksen] and Roedelius / Schneider on the Thursday night are real delights. The musical interplay between these two legendary pairs is a joy to behold. The former duo barely seem to communicate during their hour long set, as if Henriksen’s trumpet and Fennesz’s guitar were engaged in some form of mystic telepathy. Similarly evocative tones are provided on Saturday afternoon by French composer ]Sylvain Chauveau, with his stirring combination of acoustic guitar/ebow drones, piano and sombre vocals. Incubate has always held its doors open to 'heavy' bands of various stripes, but this year it’s hard not to see it taking on a new level of diversity in this category too. Melvins are as delightfully eccentric as ever, King Buzzo’s colossal riffs frequently collapsing in on one another under the weight of their own sonic mass. Dead Neanderthal, joined by Norwegian noise artist Toft, make most of their guitar-band competitors sounds soft by comparison. The enormous drones and the pulverising nature of Otto Kokke and Rene Aquarius’s sax/drums conversations wipe many of the other bands on the bill off the map. Standing against the tide they produce are the likes of unparalleled garage avant-garde jazz trio Fire!, hyper-manic returned grindcore troupe Throats, ever-reliable industrial psych troupe Teeth of the Sea, and the gigantic post-Godflesh bass tones of *]James Welburn. Oh, and Converge played. I suppose they were pretty heavy too. Perhaps Incubate’s capacity for heaviness is only matched by its capacity for dancing. If any other festival – not including those solely focused one electronic music – has ever managed to put together such an incredible bill of the best in contemporary electronica as the Saturday night of Incubate 2015 then please let me know. To start off, there’s the towering dark ambient of Klara Lewis (replete with amazing visuals), the ever bewildering brilliance of Laurel Halo and the increasingly dance friendly sounds of Factory Floor. Then, throughout the night, the likes of Forward Strategy Group, Powell, Lakker, Paula Temple and Perc & Truss all make an impact. This is without mentioning performances from Samuel Kerridge and Helena Hauff the previous night. There have rarely been such good excuses for staying up until 4am at a festival. So much of what Incubate does so well comes together perfectly on its closing day. Selvhenter – possibly the best band in the contemporary jazz underground – are tremendous and unique, Tomaga]’s percussion heavy set hypnotic, Noveller (Sarah Lipstate)’s guitar work is sumptuous, Circuit des Yeux go triumphantly against the grain. Meanwhile legends Neneh Cherry, William Basinski, The Ex and Wire all manage to produce the goods with a mixture of classic cuts and new alternative approaches; my only complaint here is that it was physically impossible to see the entirety of all four of these sets! There’s even room for an old favourite to return, in the shape of underrated slowcore titans Idaho. Jeff Martin, performing solo under the name for the first time in eight years, provides a charming performance, which turns out to be one of the most memorable of the week. Of course, with such a packed bill, it’s impossible to truly make the most of everything Incubate has to offer. So I feel no shame in admitting that I failed to catch The Knife’s political theatre contribution, ‘Europa Europa’, and only saw two films – the excellent Heart Beat Ear Drum (an intriguing Z’ev portrait) and the terrifically nerdy I Dream of Wires – in addition to my music watching. The scale of Incubate is, in a sense, quite daunting. Rarely before have I spent five days dashing manically between sets with less an expectation than a sense of near-certainty that whatever I chance upon next will be worth my time. This is probably the strongest recommendation I can give Incubate. It’s a festival for true explorers of sound and culture, and it’s hard to imagine what more it could do to provide a fascinating experience for its attendees.